VIP ticket holders will receive premium seating, catered lunch, snacks, water and soda pop, beer and wine, and VIP Golf Cart parking. Price is $60/day, or $100 for both days. 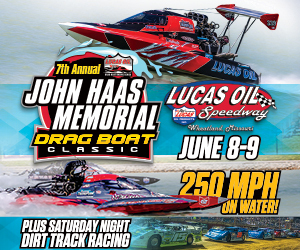 For information, contact Debi Julius at debi@lucasoildragboats.com. More information at LucasOilSpeedway.com.